The story, of course, is that Ryan Cole Stone, a 28-year-old with an eleven page rap sheet, hopped in a van with a 4-year-old inside, stole the car and commenced a frantic hour-long, 100 mph mindless skedaddle from the cops, carjacking two additional vehicles, and injuring a Colorado State Patrolman who was throwing out spike strips. The story gained national attention, so I don’t have to go into detail. Back to what that lawman had to say about the event. Well, at least once that I’m aware of, things like this did happen here; on January 29, 1968. “One of the damndest, bizarre incidences during my time as chief came on January 29, 1968. I was in Berkeley, California attending a conference and Stan Cayou, the Division Chief of Patrol at the time, called me at my hotel and said there was a hostage situation going on that was the result of a failed stickup at the King Soopers grocery store that used to be at 33rd and Dahlia in northeast Denver. “What happened was that two black males, Daniel Williams, who was also known as Charles Lovelace, and his roommate, Louis Maple, who also had an alias, Charles Davis, entered the store shortly after it opened that morning and herded the employees into the basement at gunpoint. When the manager entered the store at about 8 a.m., he thought it was strange that none of his employees were in sight. So, he headed for the back of the store to see what the hell was going on. As he walked by the meat department, the meat manager came out of the door with some guy holding a gun to his back. The gunman takes the manager and the meat manager downstairs where the other gunman is holding about thirteen people at bay. One of the gunmen then marches the manager back upstairs and demands that he open the safe which, of course, couldn’t be done because it was on a time lock. And, what the gunmen didn’t know was that when they first entered the store one of the employees had sneaked off and wrote a note that a robbery was going on and that police should be called, and held it up to the front window where two young girls saw it and they immediately called the police at a pay phone. So, the cavalry was already on its way. “When the manager and the gunman were discussing the time lock, a cop entered the store, ordered the gunman to freeze, and the manager just grabbed the gun and handed it to the officer. The gunman downstairs heard the commotion upstairs, and thought something was wrong. So, he gathered all the employees around him and ordered them to go back upstairs. In the meantime, another cop, Sergeant Larry Morahan, had entered the store and was beginning to make his way downstairs. When he got to the bottom of the stairs, the gunman surprised him and took his weapon. The gunman then demanded that Morahan get in the group of employees, who were surrounding the gunman as they all made their way back up the stairs. 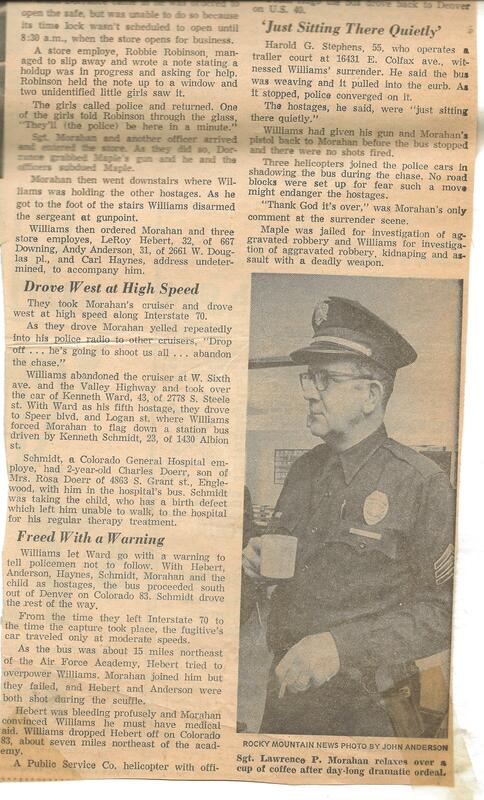 “The gunman, Williams, then took three of the store employees, and Morahan, and got in Morahan’s cruiser where they headed for I70, as Morahan yelled into the police radio that all cars should drop back or the sonofabitch was going to shoot them. At about 6th Avenue and I25, Williams ordered Morahan to stop the cruiser, and demanded that everybody get out of the cruiser. At gunpoint, Williams stopped a civilian vehicle, and he ordered everybody to get in that car. Williams told the driver to stop the car once they got to Speer and Logan, where he told Morahan to flag down a van. Morahan did that, and the van happened to belong to Colorado General Hospital, and was occupied by the driver and a two-year-old boy who was being transported to the hospital for therapy treatments for a paralyzing birth defect. 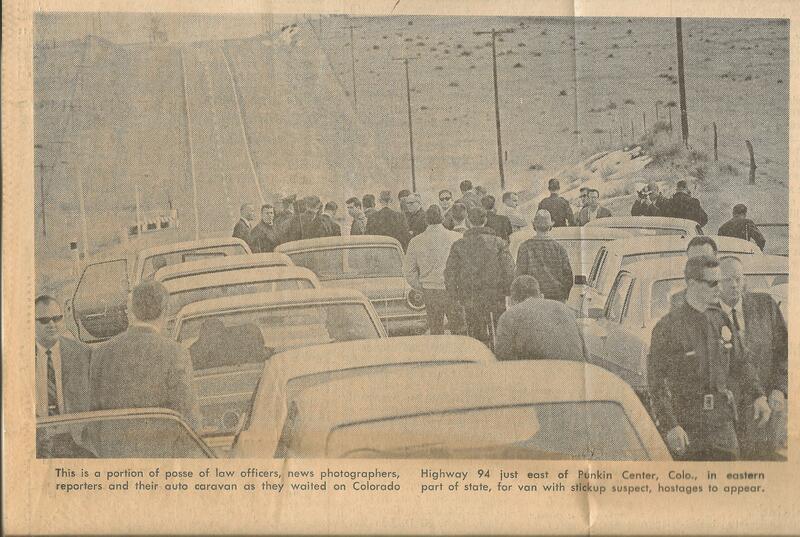 Williams let the driver of the car he hijacked go, but ordered everyone else to get into the van, and told the driver to head up Colorado 83 toward Colorado Springs. 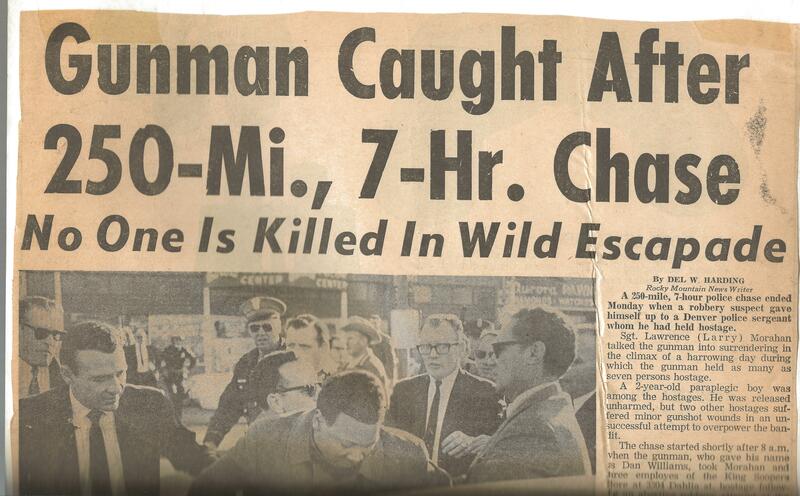 “About fifteen miles north of the Air Force Academy, one of the hostages tired to overpower Williams. 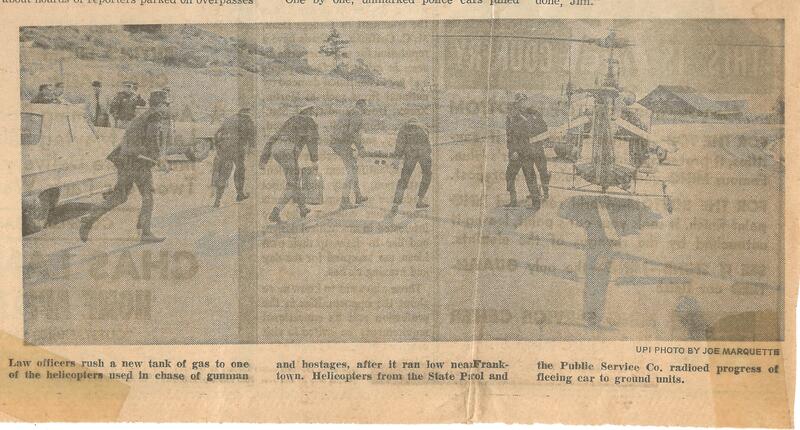 Morahan joined in and the scuffle resulted in two of the hostages getting shot. One of the hostages was bleeding badly. Morahan then began pleading with Williams to stop, telling him that the hostage was going to die if he didn’t get medical attention. So, after about eight miles, Williams did order the van to stop, and he let the wounded hostage out of the van. “Well, by this time every police agency in Colorado was alerted to the hostage situation, and there was a goddamned hundred car caravan of police and highway patrol vehicles following the van. Even John Love, the governor of Colorado, was there…chauffeured in in his black Cadillac, with a .38 on the seat next to him. Christ, it was estimated that over 300 police officers were involved in the incident with about 100 vehicles in the caravan. There were sheriffs and highway patrol officers posing as gas station attendants along the route in the hope that the van would run out of gas. Other gas stations along the route had been closed down by local law enforcement. Three helicopters were involved in the chase. “East of Punkin Center the van turned onto a county road and headed to Hugo, where Williams let the little boy out. A helicopter picked the boy up, and flew him back to Denver. It seems that Williams had some notion about wanting to go to Kansas. But, being unfamiliar with Colorado–he was from back east, New York, I believe–he ordered the van to proceed north, back to Denver. 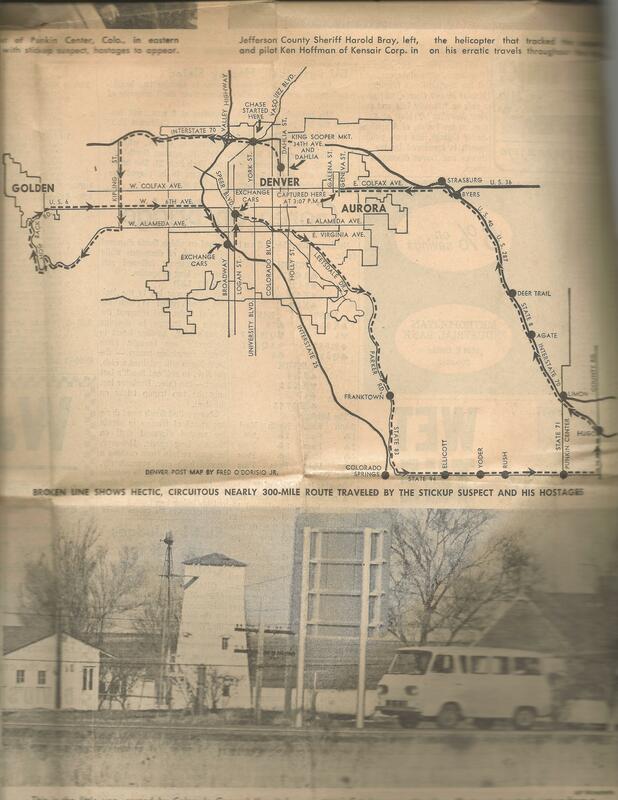 “Finally, the van pulled to a stop; it had run out of gas on East Colfax. Williams gave his gun and Morahan’s service revolver to Morahan and it was all over. Just like that. Seven hours and two-hundred and fifty miles. “The hero in all this was Morahan who, during the entire seven hours, kept at Williams to give it up; that he didn’t have a change in hell of getting out it with his life. Larry Morahan was a good cop, a good family man. Christ, he had eight or nine kids. And, you think about what could have happened and all you can do is thank God that it came out the way it did. Image | This entry was posted in Denver Cops and tagged carjacking, Chief George Seaton, Denver, Denver Police, hostages, Sergeant Larry Morahan. Bookmark the permalink.